Round vent covers shown here fit over a duct opening of 8" in diameter. This ceiling return grille has a faceplate which will measure 10 5/8" and should be screw mounted into wall. The round vent covers come with screws and allow air to flow in and out of the unit because there is no damper attached to the back. Our ceiling return grille is made out of all steel and comes as one unit, no assembly required. 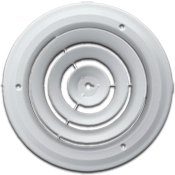 These round vent covers are durable and stylish with this traditional white painted finish. The ceiling return grille finish is also powder coated for protection to help prevent tarnishing from occurring. Use these round vent covers in both your home or at your office! Shipping for the ceiling return grille is set at just one low cost no matter how many you order. Tip: This ceiling return grille should be ordered according to your ceiling hole opening. 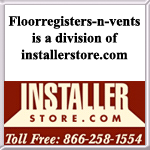 The 8" round vent covers faceplate will properly cover a hole opening of 8". This ceiling return grille can also be purchased with a damper which will close off airflow for when not in use. Buy our round vent covers today to remove and update old ceiling grilles which might have rusted over time in your home.